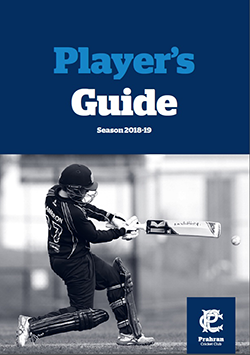 The 2018-19 Player Information Pack provides information about about playing cricket at the Prahran Cricket Club. Information about the club and its history, key coaching and committee contacts, registration, uniforms, our sponsors and much more. The club has developed a three-year strategic plan to guide our development and operations over the next three years. All registered players can reduce their membership fee by $100 by finding themselves a personal sponsor. For the small amount of $250 a company or person can sponsor you and receive acknowledgement on our website and on a framed photo of you displayed in the Lux Pavilion. Parents and supporters of the club can support the True Blues by becoming Social or Loxton Club Members. Club dinners are held in the Lux Pavilion or at the College Lawn Hotel on most selection nights throughout the season. All players are required to attend and family and friends are most welcome. Prahran Cricket Club is a not-for-profit organisation and our success relies on help from many volunteers. Every player/family will ideally provide some volunteering during the season. Some roles are fixed roles but others might only occur on specific occasions.